From a distance, the firestorm surrounding Chicago mayor Rahm Emanuel would seem most likely to end in his political demise. The white mayor of a racially divided city, whose political weakness became evident during his difficult reelection campaign last year, is implicated in a cover-up of an apparently brutal and pointless police killing of an African-American teen, and accused of ignoring a long pattern of such behavior in the past. Protests mount, soon focused on demands that the mayor resign. Another highly suspect police shooting, this time involving a bystander, exacerbates tensions. National civil-rights figures begin to echo the demand for the mayor’s resignation. Add into the background a long list of grievances involving Emanuel as a congressman and a high-ranking White House staffer that occurred before he became mayor, and the odds of him hanging on would seem to drop even more. 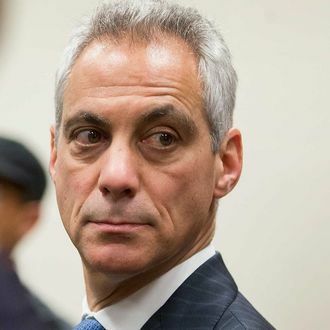 And yet: Just when you’d figure Rahm Emanuel was on the ropes, the consensus of his local critics in elected office — including key African-American pols — is to keep him in office, albeit on a tight leash. Protesters may be taking to the streets and demanding Emanuel’s resignation, but many in the Illinois political establishment are more resistant to join the fray. The state’s congressional delegation has stayed mum on Emanuel’s future, and many aldermen on the Chicago City Council – including in the black caucus – have yet to call on him to resign. A new bill in the state legislature in Springfield to let Chicago voters recall Emanuel has won only scant support and is opposed by powerful Democratic leaders. In short, Emanuel seems safe – for now. Davis’ voice carries extra significance since it was in his West Chicago district where the latest episode of police violence occurred over the weekend. After responding to a call of domestic violence, police shot and killed 55-year-old Bettie Jones, and 19-year-old Quintonio LeGrier, who appeared to be suffering from mental health issues. Police said that Jones – an African-American mother of five – had been “accidentally” shot…. This sorta kinda support for Emanuel is clearly contingent on his future behavior. Howard Brookins, a Chicago alderman and former chairman of the city council’s black caucus, told CNN Monday he isn’t calling on Emanuel to resign but has “been disappointed in the handling of this matter” since April when he called for the release of the McDonald video. Maybe some of this forbearance is attributable to Emanuel’s recent (and uncharacteristic) contrition over the shooting of Laquan McDonald and its subsequent handling by the city, which included a long delay in the release of highly incriminating police video of the shooting, and a quick settlement with McDonald’s family to pay what looked like possible hush money — all occurring suspiciously close to the mayoral elections. Conciliatory words aside, Emanuel did fire his police superintendent and has pledged to take action on police behavior generally. But you get the feeling something else is going on. For one thing, it is simply hard to imagine Rahm Emanuel actually quitting his job. But he is by all accounts a highly transactional pol for whom power and the ability to use it is the coin of the realm. He knows he’s going to have to go hat in hand to many past and present critics to rebuild the political capital he needs to function as mayor, and they know it, too. So like Bobby Rush, they’d rather deal with the devil they know than invite the “chaos” of a resignation followed by a succession struggle in the City Council and then a special election. Perhaps under extreme duress Emanuel will do all the things he might have done earlier to restore his severely eroded credibility in many of his city’s neighborhoods. If not, then the protests may come back with a vengeance.